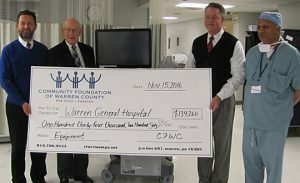 The Community Foundation provided a grant to support the purchase of a mini C-arm for Warren General Hospital. This portable x-ray unit can be taken to the patient, providing information to doctors and in particular surgeons, in real time. This improves patient care and patient outcomes. This is just one of the many ways the Foundation is committed to supporting health focused initiatives serving Warren County residents.